Why are you different from other trekking companies? We as an accredited outdoor recreation business can help you from the start of the process to the finish of the tour. This means we are not a Travel Agent who sell adventure activities to the public with no qualifications to carry out the activities and little knowledge of the Adventure Tour Industry. Be careful many business run operations with no qualifications. Ask your operator if they have any knowledge of the Adventure Activity Standards. We operate in Australia as well as many locations through out the globe offering a wide range of experience and skills second to none. Our tours encompass a high level of historical content that many other operators leave out. Our tour give you battle site tuition, talk about what life was like for the solider and we give you detailed maps before the tour to help create a 3D picture of the battles when you are standing on the location. We offer 9 day Kokoda treks and also 2 additional days can be added to most tours to visit the northern beach battle sites where the Japanese landed and where defeated at the conclusion to the Kokoda campaign.Less than 5% of Kokoda trekkers visit the beaches and miss out on much history, culture and relaxing time in a beautiful ocean village. Culture is a must in all our tours and our guides have a deep understanding of the local culture, respect for and from the local land owners and explain this to you as part of your tour. Group size maximum is 15 far far less than the other groups we pass who advertise a minimum similar to ours however load the groups up to 20,30,40 and even larger! We area boutique operator running fewer numbers and higher quality. Larger is not better, you will see the difference with us once on the track and our personal service before the tour is prompt and detailed. Who owns Escape Trekking Adventures? Shane & Tina Goodwin Own Escape Trekking Adventures. Escape Trekking Adventures is an Australian family owned business, who do not seek to make great profits but share diverse experiences with people and provide better lives for our staff aboard. (see our company profile page for details). Do you have an office in PNG and Australia? Escape trekking Adventures has an office, staff and storage facilities in Port Moresby. Our Australian Head Office in the Hunter area of New South Wales. 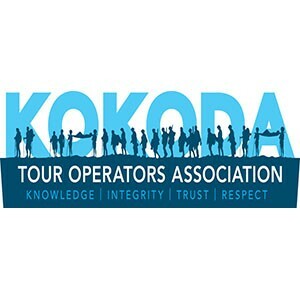 Are you a licensed trek operator with the Kokoda Track Authority? If so what is your Trek Operator License Number? Yes, Escape Trekking Adventures is a licensed Operator our registration number is 104. equipment to the schools along the Kokoda Track and Northern Beaches. Do you have a detailed Risk Assessment in regard to the leading of trek groups across the Kokoda Trail? Yes, we have a detailed risk assessment and safe operating procedures to back this up (having a risk assessment is only the starting point for safety). A daily risk assessments underpins the main risk assessment as we work in a dynamic environment and this requires a daily if not hourly assessment to changing conditions. Our planning and preparation documentation mirrors the format required to operate in Australian national parks and crown land locations. Our practises are industry leading in safety and once on the track you will see the difference between us and our competitors. Do you carry a satellite phone on each trip? Yes, we do. We carry a satellite phone a spare battery and a power bank with a solar panel to ensure we have contact with the outside world at all times. Do you provide a First Aid Kit for the trek group? Yes, we have comprehensive first aide equipment supplies for any incident. We of course like you to carry the basic first aid kit. As does any other company. This just ensures we have enough supplies if there was an accident of any sort. All our guides are highly trained in Wilderness First Aide and Australian Standard Senior First Aid. Do you provide a detailed trek itinerary to the Kokoda Track Authority prior to the commencement of each trek? Yes, where possible we have a standardised our itineraries to complement the nutrition being matched to the length of the day, meaning we stay at the same campsites, eating the same meals on the same days for each trip. Our itineraries are set with knowing walking times between each location. Our guides do not walk you 12 hours one day to prove how hard it can be or run their own affair as both rear links in PNG and Australia must know the groups intentions at all times, this is a safe practise that we are the only ones to offer. Is your rear link in PNG & Australia available on a 24/7 basis during the conduct of your treks? Yes, our bases are 24/7 contactable and carry emergency management duty cards to carry out evacuations successfully even under the most stressful circumstances. Yes, Escape Trekking Adventures holds 10 million policy cover and this is through an Australian insurer and under written by Lloyds of London. How large are your group sizes? ETA are exist for a number of reasons and one of these is employment. For this reason we run treks with trekker numbers as low as 6 persons, and take on overage 11 trekkers per trek. Our Maximum group size on our standard advertised departures is 15, this make our treks more personal, professional and safe. We have the capacity to take larger groups and can cater for up to 70 trekkers on the track at once for private departures. What type of food do you serve on your tours? Catering, it is said an Army marches on it’s stomach. ETA have dedicated Cooks (who are well versed with Food Hygiene and handling) on the trek who produce culinary delights both local grown and western variety with the right balance of carbohydrates and protein to ensure you have all what you need to keep you going each day. Signature dishes can be vegetarian sushi rolls, pizzas, cakes, curries, potato fritters, fresh scones to name but some of our surprises.! We do not issue rations packs to our trekkers. Our meals are made up with fresh ingredients and dried Australian beef to make hearty and tasty meals. We purchase our food from supermarkets in Port Moresby and add fresh fruit and vegetables from the village communities to our meals. Please remember the age old rule of if you don’t peel it your self or its not cooked than don’t eat it. What can I purchase from Along the Kokoda Track? Along the track there are numerous opportunities to buy cans of Coke etc., Twisties, local nuts, pau pau. Sometimes there is opportunity to buy Billums (local made bag), beanies and necklaces however while we have seen this increase, it is can be irregular at best. Do you provide accommodation in Port Moresby on the first and last night in PNG? Is breakfast and dinner provided in the price of our accommodation in Port Moresby? beneficial for you to have options. Do you have to share a tent with another trekker? for yourself and all your gear. Our tents are extremely hard wearing (Black Wolf Grasshopper). Do you provide all meals during the trek? coffee and a snack provided. We do advise you to bring along snacks such as muslie bars, protein bars or lollies to get you through between meals. Do trekkers in the group have to assist with the preparation and serving of meals? trained and educated in the importance of safe food handling. Do you rely on local villagers to provide any meals? No, not at all. We employ more porters than the average company to carry extra food supplies. bananas, avocado and the best pineapple you will ever eat! Do I have to carry my own tent? Personal Porter – No if you hire a personal porter will carry the tent for you and set the tent up each night as well as pack it away each morning. No Personal Porter – Yes you will be required to carry your tent if you do not hire a personal porter, one of our porters will set the tent up each night as well as pack it away each morning. Do we have to sleep in any village huts? Can erect your tent in the village huts if you like. This is actually quite cosy, however this must not impede our porters sleeping areas and in peak times will not be available as our porters require ample space to sleep. Are mosquito-proof nets provided in village huts? We prefer that you use your tent. This way we know your are going to be mosquito safe. This is a far better option than using a mosquito net as they seem to be difficult to stay under at night especially if you are a restless sleeper. Is the cost of a local flight between Port Moresby and Kokoda included? Yes, this cost is included. Do you provide a commemorative polo shirt to each trekker? Do we visit the Bomana War Cemetery? Yes! When you register we send you a commemorative Polo and also a training t-shirt. Yes, depending on which direction you are travelling, as to whether it is the beginning or end of your trek. We definitely visit the Bomana War Cemetery. Does the hotel have secure storage facilities for gear we do not require for trekking? The Hotels we use has baggage storage facilities and safety deposit boxes. This means you can leave your non trekking gear in the storage facility while you trek the trail. You can leave passports/travel documents, valuables in the safety deposit boxes or carry your passport with you on the track in a zip lock bag. To organise this please ask the staff at the front desk in the Hotel reception. To be honest both directions are very challenging and require a good level of physical fitness. It acclimatises people’s bodies better in this direction with better/more section of staging points (campsites). It has longer sustained climbs but are not steep and sharp like the southern end. The most relics and sites to see on the trek are in the first half when you are fresher and feel more energetic, enthusiastic to see them and take part in services. People tend to be over it by the end of the tour thus enjoying the sights and relics less. There is so much to see in the first 3 days and you need to take time to venture off the track to see it. You get to visit the Bomana cemetery at the end of the tour after you have walked in the footsteps of the diggers, I find this is a more powerful moment when you drive into the car park and see all of these headstones. The finish at Owers is on a climb, if you conclude at Kokoda it is done on the flat for the last 7 klm and you can see the finish line from a long way off. Getting to and front the track at Kokoda is the most difficult part of the adventure with many issues that could possibly unfold, flat tyres, flooded rivers, fog delays, cancelled flights etc. I prefer to take on these at the beginning of the trip and not chance the delays at the conclusion. PNG is special for all of the mishaps and all operators face these. I always say if you can run an efficient business in PNG you can operate anywhere in the world! Do you have a guide to deliver the historical commentary of the Kokoda Trail campaign? Yes, our guides are all highly trained in briefing clients on battlefield history for the entire length of the tour. There is relevant history from start to finish each day and we include a detailed brief of the things that took place there. All of our guides are passionate about Kokoda, its history and its people. Is the guide an Australian or PNG national? All of our tours are Australian led. This is for a variety of reasons, our guides are highly skilled, pay the correct attention to the historical aspects of this tour, can handle medical emergencies better than your run of the mill tour operator and most of all being Australian we know what Australians wont. We employe PNG nationals as trek guides to manage the local porter team. Do you conduct a DAWN SERVICE at the Isurava Memorial? We conduct a few services along the track, there is more than Isurava to commemorate. We choose Brigade Hill as it is an original battle site and less disturbed. We hold a minute silence and history briefing at Isurava. Do you take the eco-short cut via Naduri village? Yes we do pass through Myola on to Naduri village where this was the home village of Ovuru Ndiki, who sadly passed away in 2013. Ovuru was one of the last living Fuzzy Wuzzy Angels, here we visit the tomb of Ovuru’s as we commemorate the service of the Fuzzy Wuzzy Angels. Kokoda was a network of trails before, during and after the war, it is a marketing technique to state that they walk the original Kokoda Trail as this is untrue. However we walk the closest to the war time trail as any other operator. Over the last 74 + years the trail has shifted and moved as has the villages so no one can walk the exact trail as it does not exist. We do walk and visit all the historical battle sites not missing any (some do walk past some to save money). Do you provide a Certificate of Completion at the end of the trek? Yes we do! This is presented at our celebration dinner on the night we return. Do I need a visa to travel to PNG? Yes. You can apply for your Visa at the Papua New Guinea Consulate in Brisbane or Canberra (you will need to send your passport). There is information regarding Entry Visas on the Papua New Guinea Consulate website, the cost is approximately $0 + postage. What airlines fly to PNG? Qantas, Virgin and Air Niugini all fly to Port Moresby (your joining location) 7 days a week. Will you have a representative meet us when we arrive at the Port Moresby Airport? Yes,Tracy Operations Manager in PNG will be there to meet you at the airport. Our Australian Guides will be awaiting you at the hotel with your prepared rooms ready to check in. Can We bring food into PNG? Yes you can. You must declare your food and advise customs that it is for trekking on the Kokoda Track. Pre package food has never been a problem before to pass customs. Do you provide transport between the airport and our accommodation in Port Moresby? Yes, this includes pickup and departure droop off’s on the dates advertised for the tour. Why do I need a water bottle and 3L water bladder? Kokoda is a hot and humid environment that requires a high consumption of water. To reach the required consumption you need to take frequent sips often. We find that consuming large volumes of water while trekking you need a water bladder to sip on. The Water bottles are used to treat your water with purification tablets prior to drinking. The time need to purify can vary form 1 hour up to 4 hours depending on the treatment used. What type of sleeping bag do I need? At higher elevations the night times on the Kokoda Trail can get quite cool. We recommend that you get a sleeping bag rated to +5 degrees Celsius. Synthetic bags hold a slight advantage in moist environments although a down bag can do the job more than adequately if you look after the bag. For Down bags ensure the are stored inside a waterproof bag to keep moister away, another good tip is to place the bag out in the sun when you arrive into camp to help dry any moister out (this is helpful for all types of bags). What do I need a raincoat/spray jacket? A lightweight coat is used at night for warmth and allows you to get around from hut to hut or tent to the toilet at night keeping dry if it is raining. How big does my daypack have to be? 30-40L is a good size. This allows you to fit all of your equipment inside with out having a bulging over full bag that requires unpacking to get something out from inside it. How big does my backpack have to be (if you don't have a personal porter)? 75 -85L is a good size to fit all of your required equipment. Any larger and you will find that you will just over fill the bag with unnecessary equipment. What type of foot wear do you suggest I wear? We recommend full length hiking boots for ankle and lower leg support. Boots are your single most important investment for this and future trips so time must be taken to try on at least 5-10 pairs of different hiking boots. I toughly recommend you go to a specialist-hiking store for the fit out such as Paddy Pallin, Trek and Travel, Mountain Designs, Adventure 195. Do you suggest I wear Shorts or long pants? Shorts combined with a low cut gaiter is the best option to keep your core body temperature cool. There is very little vegetation or protruding objects to contend with. Long pants tends to led to prickly heat and rashes. What type of shorts do you suggest I wear? There are many options available to you in this department from lightweight shorts combined with a gym lycra pant worn underneath to running shorts with in built lycra option. I have used both combinations with success but I found the inbuilt option to take longer to dry once wet. Yes this is a highly advisable equipment item. What type of gaiters do I need? Low cut water resistant gaiters are the best option. These gaiters cover your boot and finish just above your ankle. You do not require full height gaiters that come up to your knees. Do I need a walking pole? Walking poles are another highly recommended equipment item to assist you while trekking. They will provide balance when negotiating slippery muddy descents and take the shock loading off your knees also. I find when ascending they help by sharing the load as you climb large steps in the terrain. One walking pole or two? This is a personal preference for each person, however many people find one pole adequate as there is usually something to grab on to with the other arm such as a hand, tree, rock etc. We understand and can recognise altitude sickness symptoms, this is important as many people suffer disabilities and even death from altitude sickness each year in Nepal at surprisingly low elevations. Group size maximum is 14 far far less than the other groups we pass who advertise a minimum similar to ours however load the groups up to 20,30,40 and even larger! Do you have an office and staff in Nepal and Australia? Escape trekking Adventures has an office, staff and storage facilities in Kathmandu. Our Australian Head Office in the Hunter area of New South Wales. Do you have a detailed risk assessment ? Yes, we do. We carry a satellite phone to ensure we have contact with the outside world at all times. During the recent earthquakes in Nepal this highlighted the importance of such a device. Do you carry a first aid kit on each trip? Yes, we have comprehensive first aide equipment supplies for any incident. We of course like you to carry the basic first aid kit. As does any other company. This just ensures we have enough supplies if there was an accident of any sort. All our guides are highly trained in Wilderness First Aid and Australian Standard Senior First Aid. Is trekking Everest Base Camp dangerous? Yes, it is and many people each year going missing in storms, avalanches or die from high altitude related sickness. By trekking with an international operator with comprehensive risk management plans you lower your exposure to risk as low as reasonably practical. Remember don’t die for your dreams. Is your rear link bases in Nepal and Australia on 24/7 standby during trekking operations? Do you hold public liability insurance? Do you provide a detailed itinerary of our tour for my next of kin to know my location? Yes, Escape Trekking Adventures provides you with a detailed itinerary and we update our social media pages with your progress. We can make other arrangements should your next of kin not have a social media account. ETA are exist for a number of reasons and one of these is employment. For this reason we run treks with trekker numbers as low as 6 persons, and take on overage 11 trekkers per trek. Our Maximum group size on our standard advertised departures is 14, this make our treks more personal, professional and safe. We have the capacity to take larger groups and can cater for up to 60 trekkers at once in Nepal for private departures. What type of food is available on this tour? Staying in quality lodges along the trail to Base camp you can order a wide range of items to eat such as pastas, pizzas, roti’s, breads, stews, soups, porridge, pancakes, cereals just to name a few items. We recommend that at loges above Namche Bazar (on the base camp side of the trial) that you stick to vegetarian meals and avoid the contamination risk of meats. What can I purchase while on this tour? Just about anything can be now purchased in the larger villages such as Lukla, Namche and Khumjung. Anyting from medications right the way through to souvenirs. At the smaller villages you can purchase basic items such as wet wipes, toilet paper, hand cleaner, snacks and basic medications. The higher the elevation the higher the price. Do you provide accommodation pre and post tour in Kathmandu? Yes, your package includes multiple nights pre and post tour in Kathmandu in a clean, safe and comfortable hotel. We also include sightseeing in our packages. Is breakfast included in the hotel accommodation in Kathmandu? Yes, your package includes breakfast daily while staying in the hotel. Do I have to share another room with a trekker? Yes, your package is a twin share style arrangement. Single supplement can be arranged for an additional cost. Do you provide all the meals while trekking? Yes, your package includes all of the meals while trekking. Can I eat anything from the menu? Yes, your package includes any item from the menu and as much as you like. Chocolates, chips, sweets and soft drinks are excluded from the package. Is the cost of the flight from Kathmandu to Lukla return included? Yes, your package includes a return flight from Kathmandu to Lukla. In the event of flight delays due to fog/cloud a helicopter may be required. This costs are additional however the price of the airfare is taken off the helicopter rental price.In a group of 4 expect to pay $4-600. This can be claimed from most travel insurers if it is to get you out of Lukla to meet your international flights. Do you provide a commemorative polo shirt for the tour? Yes we provide you with a quality polo shirt for this tour. Does the hotel have secure storage facilities for the gear we do not require for trekking? Do you need a visa to travel to Nepal? Australian Passport holders who will be trekking in the Nepal region are required to obtain a Tourist Visa to visit Nepal. Tourist visas to Nepal vary in costs. See below table for costing’s for Australian citizens. Your visas can be arranged and approved before arrival in Nepal or obtained upon arrival but expect lengthily delays. For on the spot or urgent Visa processing add $15.00 more. 30 Day Multiple Entry Visa Valid for 30 days from the date of entry AU $85.00 For on the spot or urgent Visa processing add $15.00 more. 90 Day Multiple Entry Visa Valid for 90 days from the date of entry AU $175.00 For on the spot or urgent Visa processing add $15.00 more. What airlines fly to Nepal? Multiple airlines fly to Nepal with some of them being Malaysian airlines, Singapore airlines, China Southern and Thai airlines. Will there be a company representative at the airport in Kathmandu to meet us? Yes,our Operations Manager in Nepal will be there to meet you at the airport. Our Australian Guides (Australian led tours only) will be awaiting you at the hotel with your prepared rooms ready to check in. Can I bring food into Nepal? Yes you can. You must declare your food and advise customs that it is for trekking. The food must be processed and packaged. Pre package food has never been a problem before to pass customs. Is the transfer from the airport to the meeting location of the tour included? Yes, this includes pickup and departure drop off’s on the dates advertised for the tour for Kathmandu international airport. Can I use a water bladder instead of bottles? No, You must have 2-3 water bottles in the sizing of 1 litre that has the ability to hold boiling water. Look at plastic water bottles from the major specialised camping stores (avoid cheap bottles under $10). Water bladders are able to be used for the lower elevations of the tours however depending on the weather and elevation the tube you drink from will freeze. Insulated bags and piping for the bladders can delay the freezing along with turning the bladder up side down and blowing the water out of the tube after every drink. This can be troublesome and fatiguing on the longer days for some. Bring both bladder and bottles. What type of sleeping bag will I need? You will need a sleeping bag that has the rating of -20 degrees Celsius. Sleeping bags have 3 ratings the comfort rating should be -20. The EN13537 standard provides three temperature levels to guide a consumer in their choice Comfort – This is the rating/temperature at which a standard woman can expect to sleep comfortably in a relaxed position. If you consider yourself a cold sleeper use this rating to decide the coldest temperature the sleeping bag is suitable for. Lower Limit – the temperature at which a standard man can sleep for eight hours in a curled position without waking. If you consider yourself a warm sleeper you can use this rating to decide the coldest temperature the sleeping bag is suitable for. Extreme – this is a survival only rating for a standard woman. Between the lower limit and the extreme rating a strong sensation of cold has to be expected and there is a risk of health damage due to hypothermia. This is an extreme survival rating only, we do not recommend you rely on this rating for general use. Should I use a duffle bag or a backpack for my porter to carry my belongings? A duffel bag is the bag of choice for our porters. Please do not bring large back packs for this tour as it is unsuitable for the porters to carry. Porters in Nepal prefer to carry bags on top of their heads instead of on their shoulders. How big does my duffel bag have to be? Get a bag with plenty of room in it. We recommend a bag around 120 litres in size or bigger. Do not get a bag smaller than this. How big does my day pack have to be? Get a bag with plenty of room in it. We recommend a bag around 35-40 litres in size. What type of footwear do you suggest I wear? Sports shoes provide inadequate insulation and weather resistance in cold climates. Yes this is a highly advisable equipment item. This item will help keep rain and snow out of your boots.